Special Containment Procedures: SCP-4848 is designated a HEBERT-category memetic hazard and as such its specifics and all documents in which these specifics are described are restricted to the immediate research team and Level-1 personnel. If SCP-4848 is accessed, standard memetic transmission precautions should be followed and post-exposure amnestics administered. Foundation sources within national militaries, research institutions and defence contractors are to report all possible instances of SCP-4848 outside of containment. All individuals confirmed to be affected by SCP-4848 should receive Class-D amnestics. The Foundation is cooperating with governments and industry to cancel projects influenced by SCP-4848. Management of SCP-4848 has been repurposed to control rather than eradication. Individuals affected by SCP-4848 are to be tracked, with amnesticisation of any of their contacts who become newly affected, but affected individuals should not be administered long-term amnestics. Projects influenced by SCP-4848 are to be allowed to run to completion without Foundation interference. Description: SCP-4848 is a memetic hazard consisting of the phrase '████████ █████-███████ ██████████' spread via auditory and visual means. It causes susceptible individuals to become preoccupied with the phrase, resulting in a desire to integrate it into their work routines and projects. As the phrase has no clear definition and is interpreted differently between individuals, this results in delays, alterations and shifting objectives and a subsequent overall reduction in working efficiency. SCP-4848 also exhibits self-concealing properties, which conceal insight into its anomalous nature from persons without specialised counter-memetics training. SCP-4848 exhibits its maximal effect on individuals directly involved in the armaments industry. Individuals with related professions, such as military personnel, shipping, electronics and aerospace industry workers, and academics conducting research with military applications, are affected to a lesser degree. Individuals outside these categories are effectively immune. The effects of SCP-4848 result in a given project being delayed and over budget by 10% to 200%, depending on project characteristics and SCP-4848 saturation amongst workers. These anomalous properties are a result of SCP-4848’s origin as an engineered memetic attack vector developed by GRU Division ‘P’ to target the West. Given the subtle nature of SCP-4848, this was not detected by either the Foundation or Western intelligence agencies until the collapse of the USSR and the acquisition of GRU documents and defectors by the Foundation. RESPONSIBLE PERSONNEL: Alexander R. Morozov к.т.н. DETAIL: Project No. 103 "TERMITE" is the designation of an engineered abnormality of the Psychological Subdivision, with development commenced in January 1983. "TERMITE" involves an English-language idea complex, analogous to [EXPUNGED] in Russian. Exposure to "TERMITE" in persons involved in the design and production of munitions leads to a fixation on the complex and its incorporation into work-related activity. This introduces inefficiency and increases to production times and costs. Additionally, the "TERMITE" complex exhibits self-concealing normalcy properties, hampering its eradication in the event of involvement of agencies aware of abnormalities. "TERMITE" has been designed to target the war-making capacity of the Main Adversary. Its English-language nature ensures it will propagate throughout the American military apparatus with minimal risk of harm to the defence of the Soviet Union. It is expected there will also be a degree of effect on other Western military-industrial systems, due to the commonality of English in the NATO structure. Field testing of "TERMITE" in a subdivision of Izhevsk Factory No. 11 in August 1984 resulted in a 45% reduction in ammunition production over the following four months. No physical, psychological or abnormal measures available to the Directorate were able to reverse the effects of "TERMITE" in affected personnel, who required relocation and indefinite quarantine. A list of safe handling procedures for personnel involved with "TERMITE" can be found in Appendix A. Due to the results of field testing, plans have been prepared for deployment of "TERMITE" in America. This will be performed over a period of three months by in-place Directorate assets. Details of this have been presented in Appendix B and are currently awaiting the approval of General Ivashutin. It is predicted that successful propagation of "TERMITE" in America will lead to the decisive superiority of the Soviet Armed Forces in the event of NATO aggression against the Soviet Union. Alternatively, the reallocation of resources to mitigate the effects of "TERMITE" on NATO military industry is likely to result in a decrease in civilian production to a degree resulting in significant civil unrest and the energisation of both pacifist and friendly socialist political elements. RECIPIENT: Alexander R. Morozov к.т.н. DETAIL: Despite authorisation of a wide-ranging release of "TERMITE" in the United States and confirmation of its presence throughout the American military-industrial complex, evidence of any negative impact on American military readiness has been lacking. While the research team has attempted to rectify these deficiencies, the recent demonstration of American military capabilities in the Persian Gulf has not been encouraging in our evaluation of this progress. Combined with further developments in the domestic and international political situation, the Directorate has deemed the continuation of Project No. 105 to be an inappropriate use of our limited resources. We thank Comrade Morozov for his service and he will be reassigned in due course. Note participants de-identified (approved by Site Director Zacharias). MANAGER: Uh, yeah, Phil, about that - did you look at the doc I sent you about the anti-ship standoff capability? ENGINEER 2: Won't that interfere with the radar profile goals? ENGINEER 1: It's already carrying external munitions. ENGINEER 3: I don't know if the wing stress tests have been run with Harpoons. I'd have to go back and re-run them again. ENGINEER 1: Christ. Why does this thing need anti-ship standoff anyway? MANAGER: It was a deficiency identified in the last demo prototype. ENGINEER 3: I guess if the Navy wants it, they'd want to put Harpoons on it. We're trying to design something with ████████ █████-███████ ██████████, right? ENGINEER 2: This is supposed to be a stealth jet. If that keeps being diluted with the munitions reqs, it's not going to be able to fulfil ████████ goals. MANAGER: Would you be able to enlarge the internals, Phil? We need to retain the █████-███████ ██████████. ENGINEER 1: Maybe? It would delay the next prototype. Do we have the budget for that? MANAGER: The Pentagon is on board with this. Sec Winter isn't happy, but he's earmarked us the funds to get this done. ENGINEER 3: Might be easier to reduce the missile size rather than enlarging the internals. ENGINEER 1: I'm sure we don't have the budget for that. ENGINEER 3: A new Harpoon with ████████ █████-███████ ██████████? ENGINEER 2: I've got enough work to do already. MANAGER: That's not a bad idea. I heard there was a Navy contract out for a ████████ air-launched missile. ENGINEER 2: You guys lost? Y-1: Sorry, gentlemen - FBI. We're doing a security screen. Going to have to ask you to come with us. Addendum 4848-3: On 11/11/2008, Dr A. R. Morozov (see Addendum 4848-1) presented himself at the Foundation's Berlin office and requested protection, bringing a number of documents relating to the development of SCP-4848. A transcript of his initial interview has been attached below. ERHARDT: Agent Paul Erhardt. I understand you have information for us? MOROZOV: I see. No need for concern, Mr Erhardt. Only wanted to see how much explaining you needed. ERHARDT: Scheiße! Warn me first before you do that. MOROZOV: It won't happen again. So. Project one-zero-five. Your Foundation has a number for it by now, I hope. MOROZOV: 4848, if you prefer, I was part of the development team. You may know this already, and I expect you know more what we did with 4848 in the West than I do. ERHARDT: Sorry, I can't disclose that information. MOROZOV: Of course. You know this was distributed across Russia as well? Ah, I see you reacted there. This is new to you. ERHARDT: Where is your source for this? It's not in any of the documents you presented to us. MOROZOV: I am the source. Well, and some friends of mine, whose names are not for discussion, as a condition of my assistance to you. ERHARDT: Your group tested SCP-4848 within the Soviet Union? MOROZOV: Not testing, Mr Erhardt. A… hmm, how should I put this… grassroots action, I believe they say in English. ERHARDT: You don't agree with your government? MOROZOV: Have you ever been to Chechnya, Mr Erhardt? ERHARDT: No, but I take your point. Was this in relation to the first war, or the second, or something else? MOROZOV: First. Grozny, ninety-four. Do you know about it? You would only have been a child. ERHARDT: The siege, yes. Were you there? That would not have been easy. MOROZOV: No. I'm no soldier, but I spent my whole life building weapons. I was proud of it. We were supposed to use them on you! [laughs] My mother, God rest her, told all her friends I was indispensable in stopping the NATO imperialists. I didn't argue with her. Maybe I still think that. But then, there was Afghanistan, the Union vanished, then Grozny, where Yeltsin killed five thousand of our soldiers, and then crowed over forty thousand dead Chechens, our brothers and sisters five years before. ERHARDT: Your conscience - you felt you had to do something? MOROZOV: Yes, I wanted to do something, and I remembered the one weapon that was not a weapon, the one that made people stop building them. I had a few friends, with similar thoughts - it was a very simple matter to dig up one-zero-five and start distributing it. Industry events, veterans' associations, phoning ex-colleagues and so on. This was at the start of ninety-five - I expect every factory east of Warsaw has it by now. I can give you a list of where we spread it, for whatever good it does you. ERHARDT: How did you get around the language issue? MOROZOV: Oh, that was also simple. We just told them it was part of Western military doctrine. That it didn't translate well. ERHARDT: Why are you coming to us now? If you're having second thoughts, wouldn't it be best to hand the information to your - the Russians? MOROZOV: Really, Mr Erhardt. Regrets are not enough to prevent a treason charge. But no, I have no resurgent patriotism, or regrets I tried to stop wars. I regret that we failed. Our army went back to Chechnya, and Ingushetia, and Georgia, and our weapons still match the best of you Germans or the Americans. Not all the others agree - some will never forgive me for this - but we made a terrible error. As much as I may have… issues with your organisation, your Foundation are the only ones who might still stop this. The UN's Coalition is riddled with too many warmongers to care. ERHARDT: I appreciate that you came to us with this, and my superiors will as well. I am sure we will be worthy of your trust. I don't quite understand, though. If your actions changed nothing, why the concern? MOROZOV: I said we failed. I did not say that nothing changed. ERHARDT: I'm not sure I follow. MOROZOV: In our line of work, Mr Erhardt, we are prone to believe things beyond comprehension hold fearful power. That we are helpless before them. But the most fearful powers are earthly. Addendum 4848-4: In 2015, Foundation cooperation with NATO on SCP-4848 eradication was suspended unilaterally by the latter, causing the Foundation's strategy to shift to the current containment procedures. NATO's position statement on the issue has been archived below. Foundation sources subsequently reported this decision resulted in GOC internal turmoil and a high-level restructuring, removing personnel with the belief that accepting a baseline level of SCP-4848 infection was contrary to their mission statement. Further scandal broke within the Coalition in 2016 when several officials previously involved in this policy were implicated in accepting defence industry payments, leading to the resignation of the then-PSYCHE Director, Mr Richard Evans. While small-scale studies on SCP-4848 have been conducted previously, Report 4848-2016 is the culmination of a three-year study to evaluate the impact of SCP-4848 at a global level. With recent changes to containment procedures, comprehensive information on their effects is vital in guiding future containment management. The research team analysed both publicly available and secure governmental and corporate information relating to activity and expenditure in the armaments, aerospace, electronics and shipping industry across G20 nations. Projects without direct military applications were excluded from the final analysis. This data was combined with available Foundation information on SCP-4848 distribution and the relative and absolute contribution of SCP-4848 to global military expenditure was estimated. SCP-4848 was responsible for 1.1% of global military spending in 1992, the first date from which sufficient data was available for the purposes of this study. Over the 1992-2015 period, this number increased by an average of 0.4% per annum, reaching approximately 26.1 billion real US dollars in 2015. 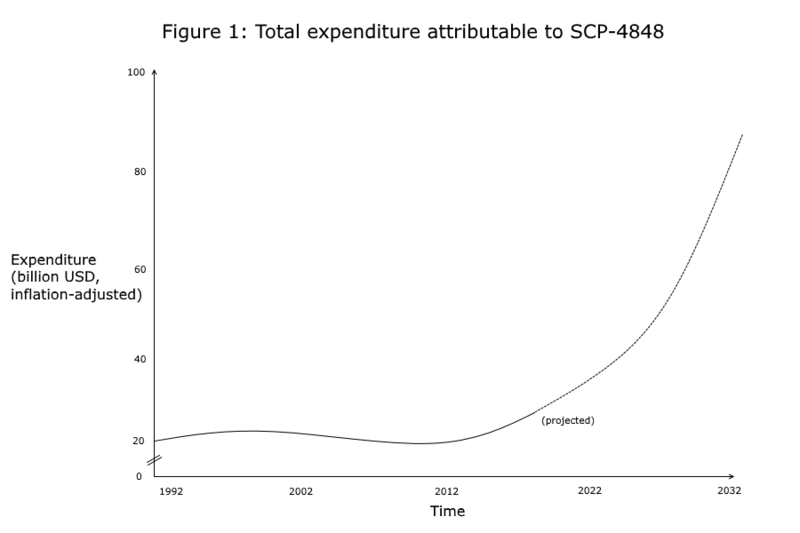 However, subsequent to the 2015 alterations to containment procedures, there was a 4.7% increase in SCP-4848-related expenditure from 2015 to 2016. Our modelling suggests that both rate of increase and total costs are expected to accelerate as SCP-4848 spread continues (see Figure 1). The findings of this report are of significant concern. In particular, our shift from an aggressive management approach to a more passive stance is strongly associated with a noticeable reduction in containment efficacy. Although complete access to GOC databases was outside the scope of this study, available information suggests substitute Coalition procedures have been unable to compensate for this change. It is possible this is influenced by conflicts of interest amongst Coalition policymakers, and it is imperative for Foundation staff to not fall into a similar trap. A reversion to the pre-2015 containment procedures should be considered. This office has noted the recent release of Report 4848-2016 and expresses appreciation for the contribution of the study authors to enhancing our understanding of this item. While we acknowledge the challenges that the 2015 procedure revision has presented, this office has confidence in the current containment procedures for SCP-4848 in reaching a suitable compromise between containment goals and maintaining the Foundation's flexible multi-mission capability to respond to anomalous threats. Based on advice from an interdepartmental committee consisting of representatives from the Department of External Affairs, Administrative Department, Scientific Department and Engineering/Technical Services, reinstating the previous containment measures is not possible at this time given the stated positions of numerous governmental and industry partners. A further rupture in relations would also impair Foundation access to numerous material and personnel resources, leading to downstream negative impacts on our technical, industrial and research capacity. This office categorically rejects the insinuation that the management of SCP-4848 is affected by conflicts of interest in any way. All staff receive extensive background checks and are obliged to act with the highest levels of integrity. 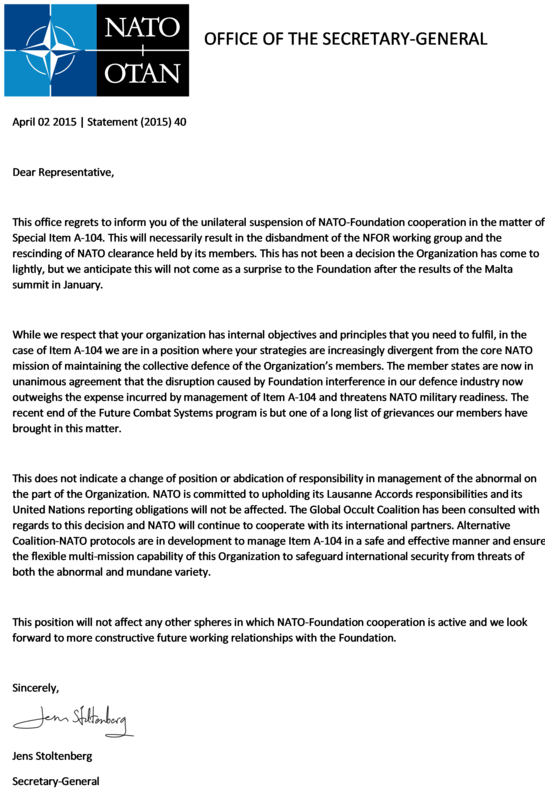 Declarations of interest are provided by all personnel and there is no evidence that any external interests have affected Foundation responses to SCP-4848. The Foundation welcomes staff from a wide variety of backgrounds, including from the defence industry, who bring invaluable experience and professional contacts. The nature of SCP-4848 and the Foundation's overarching mission necessitates cooperation with national armed forces and defence industries. The Council is confident that strong future partnerships with these institutions are integral to global security, protection and containment of the anomalous.